By the late 1940's and early 1950's, people around the world had pretty much recovered from World War II. As many of these people began to prosper again, they started to demand better, more elegant, and more entertaining things for their money. Unfortunately, at this time, the world automotive market was dominated by rather bland, but functional cars. Most automotive manufacturers, Volkswagen included, felt the need to come out with a "flagship car" to bolster their image. Witness the Ford Thunderbird, Chevrolet Corvette, and of course, the Volkswagen Karmann Ghia. The story behind the development of the Karmann Ghia is an interesting one. Volkswagen, in the early 1950's, was facing the prospect of selling a small line of "ugly" cars (the Beetle and the Bus) to a more demanding car buying public. VW executives felt it was necessary to introduce an "image" car to reach this new market. Several other car companies were in the same situation, most notably, Chrysler. Chrysler contracted with the Italian styling and coach building firm of Ghia to build a series of "dream" cars. While Chrysler produced some of these dream cars, one car they did not produce would eventually become, you guessed it, the Volkswagen Karmann Ghia. While Chrysler worked with Ghia, Volkswagen contracted with the German coach builder, Karmann to build their "image" car. Karmann, in need of a design, approached Ghia and somehow the old Chrysler design surfaced and was modified to fit the Beetle floorpan. The VW executives liked what they saw and by August of 1955, the first Volkswagen Karmann Ghias rolled off assembly line in Osnabruck, German as 1956 models. The automotive and the public instantly fell in love with the beautiful design and hand crafted workmanship, but not the performance. For the Karmann Ghia, Volkswagen decided to use the same 36 h.p. flat four engine that was being used in the Beetle at the time. While the looks and craftmanship made for a "sporty" car, the small engine did not make a "sports" car. The power was adequate and the suspension was good for the era. These two factors combined with the Karmann Ghia's great looks made for a fairly good selling car, totalling over 10,000 the first year. When the convertible came out a couple of years later in 1958, sales jumped to around 18,000 cars per year. Sales climbed steadily until the late 1960's when they peaked in the neighborhood of 33,000 cars a year. The Karmann Ghia was last produced in 1974 to make way for the new VW Scirocco. Only 365,912 coupes and 79,326 convertibles were produced which make the Karmann Ghia a fairly rare car considering it was produced for nearly 20 years. It's interesting to note that only a couple of years after the Karmann Ghia was introduced, Volkswagen refocused its efforts on the Beetle. The VW executives felt the Beetle had enough "image" of its own and that the company would be most successful if it continued to sell the Beetle by the millions. During the same time period, several other "image" cars debuted, including the afore mentioned Chevrolet Corvette and Ford Thunderbird. These cars were indeed true sports cars and in an effort to maintain sales in light of this competition, VW embarked on a unique advertising campaign. Volkswagen tried to convince consumers to focus on the beauty of the Karmann Ghia and ignore the engine (or lack thereof!). Some ads were quite funny. For instance, in one television commercial, they showed a Karmann Ghia racing toward a huge sheet of paper as to rip through it, only to bounce off of it! In some print ads, VW had the nerve to put a Ghia in the same picture as a Maserati and Lamborghini and then tell you that even though the Ghia isn't as fast, it sure costs a lot less! Today, the Karmann Ghia is one of the most sought after air-cooled Volkswagens, especially the convertibles. Appraised values of nice coupes typically run from $3,000 to $6,000 for coupes and $7,000 to $10,000 for convertibles. I've even seen some advertised for as much as $15,000! Not bad for a car that originally sold for around $3,000. Most parts are readily available, especially the mechanical parts, and are quite reasonably priced. It is quite possible to restore an old Karmann Ghia to its original beauty and add a larger engine and better suspension to come up with a "true" sports car. The biggest drawback to restoring a Ghia is that they tend to rust considerably more than other Volkswagens. This is probably due to their unibody construction the fact that they were hand built. Fortunately, there are plenty of after market body parts available and when restored by a capable body shop they can look just as good or better than original. The Karmann Ghia has a graceful, timeless design that, in 1969, was named one of the most beautifully designed products in the world. In June of 1972, Car and Driver magazine put the Karmann Ghia into world class status by comparing it to the ever classic Porsche Speedster. The Volkswagen Karmann Ghia is truly a special car. It is beautiful and timeless in design and it wonderfully affordable, reliable, and fun to drive! NOTE: I'd like to thank House of Ghia for publishing its excellent publications on this topic. I'd also like to thank Classic Motorbooks with their outstanding books, several publishing companies for their magazines (such as Car and Driver) and several individuals (too many to list!) for providing me with much of the information to write this document. Karmann GMBH, of Osnabruck, West Germany, is much more than the Volkswagen "Special Vehicles Division". It is an independent company with a proud history of its own stretching back nearly 120 years. Today, as in the past, they are makers of fine automobile bodies for a number of European manufacturers, and of tools, dies, and parts for many others. In 1901 Wilhelm Karmann purchased Klases, a coach-building firm established in 1874, and immediately renamed it, after himself. Car body building began the next year, and soon production was converted entirely to motor bodies. By the outbreak of World War 1, Karmann were making bodies for Opel, Minerva, and FN. A great proportion of these were convertibles. Such cars are never in large demand in times of war, and so further growth was naturally slow until the post-war German economy stabilised in 1921. In this year, a large order was received from the AGA motor company, which required an expansion of the plant. Throughout the twenties the firm became more successful as each year passed, as other car manufacturers engaged Karmann to build bodies for them. Wilhelm Karmann, like many other German industrialists of the time, travelled to the United States to inspect and learn the latest methods of production. Until this time, Karmann bodies were built in the old fashioned way by covering a wooden framework with sheet metal. The Great Depression of 1929 sent most of Karmann's customers to the wall, but the company was saved by a business relationship with the Adler motor company. Adler convertibles of this period were renowned for their beautifully made leak-proof roofs. In 1931, Karmann began to build Model A convertibles for Ford. By World War 2 the plant employed over 600 people. Little is known about what the factory produced during the war, but as it was almost totally destroyed by Allied bombing, one can only assume it was armaments or other material of strategic importance. The newly completed KDF plant at Wolfsburg made everything from stoves to aircraft sections to V1 flying bombs, so things were probably little different at Osnabruck. After the war, events were again similar to those at Wolfsburg. The British occupied what was left of the plant for use as a repair unit. Rebuilding was slow, as demand for special bodied motor vehicles was again non-existent. Tools, dies and body sections for more utilitarian vehicles became the company forte until Volkswagen entered the story in 1948. This work still represents two thirds of the company's turnover, with tooling having been supplied at one time or another to many European manufacturers including VW, Mercedes-Benz, Renault, Ford (Europe and US), BMW, Saab, and British Leyland. In 1948 the Hebmüller and Karmann companies were each engaged by Volkswagen to construct open top cars based on the Beetle, Hebmüller a two seat and Karmann a four seat version. Volkswagen approved both prototypes and ordered 2000 Hebmüllers and 1000 Karmann cabriolets. From these figures, the Hebmüller was expected to be the bigger seller but, as is well known, a fire destroyed the Hebmüller factory only a month after production began in 1949. Only about 700 were ever completed, with the factory struggling to rebuild on the pay-out from its inadequate insurance. At least a dozen Hebmüllers were known to have been completed by Karmann after Hebmüller finally succumbed to bankruptcy in 1952! The Karmann design fared much better. Production began in September 1949 on the brand new "Export" Beetle chassis. The first order was filled by April 1950, and VW ordered more. 10,000 were produced by August, 1950 and the car's place in an expanding VW range was now secure. 1949 cabrios are actually considered to be rarer than Hebmüllers! The Karmann Beetle cabriolet used the chassis, nose section, fenders, and front and rear lids supplied by Wolfsburg from the Beetle parts bin, with the rest of the body being either fabricated by Karmann or modified by them from standard Beetle panels. The reinforcement rails required due to the lack of a turret section were incorporated into the body below the heater channels. They were not part of the chassis. The cars were largely hand made and it has been said that no two were ever entirely the same, in that the body was built in two halves, a front and a rear, each being manoeuvred on the floor pan to achieve the best door gap before final welding together. As the Beetle evolved, so did the cabriolet. It was considerably dearer than the sedan and was always a "de-luxe" model with the most powerful engine in the range. About 330,000 were made before the model was discontinued on the 10th January 1980, the last of the Beetle models to be produced in Germany. The production figure makes the Karmann Cabriolet the biggest selling convertible car ever, echoing the success of its world champion cousin from Wolfsburg. Wilhelm Karmann died in 1952 at the age of 88 and was succeeded by his son, Wilhelm jnr. The younger Karmann, a highly qualified engineer, was good friends with an Italian by the name of Luigi Segre, who was owner and chief stylist of Carrozzeria Ghia of Turin. Volkswagen had earlier asked Karmann to design a sports car on the Beetle chassis, but had rejected all of the prototypes put to them. Wilhelm had casually mentioned this to Segre, who had some ideas of his own! Without the knowledge of either Karmann or Volkswagen, Segre procured a standard Beetle, removed its body and built on it a design study. It was shown to a surprised Wilhelm Karmann in 1953. Karmann arranged for Dr. Nordhoff and his vice-president Dr. Feuereisen to inspect the car. Both were highly impressed, and production prototypes were soon ordered and built. The chassis had to be widened at the front on the four or five test cars and this feature carried over into the production version.The car was launched in mid 1955 and was an instant world sensation! The Karmann Ghia was born. The Karmann Ghia, while certainly not the first small two door coupe, popularised the body style. Soon there were the inevitable imitators. One has only to look at such cars as the Renault Floride/Caravelle coupe and convertible of the late 50's and early 60's to see evidence of this. This car was based on another rear engined swing axle design, which evolved from the original 4cv 750 Renault, a prototype of which Dr. Porsche was said to at least have "advised" on when he was a prisoner of the French after the war. During the initial period of Karmann Ghia production, Karmann GMBH surprisingly had no presses large enough to bend the sections for the Ghia body. The assembly was therefore hand welded from many smaller pieces. Anyone who has undertaken a bare metal restoration even on a later Ghia will tell you that there are some welds in some very unlikely places! The lower frontal area of the coupe enabled the heavier car to reach a higher top speed more economically than a 36hp Beetle, but the acceleration was even slower! A Wolfsburg in sheep's clothing? The convertible version which followed in 1956 was an in house modification of the coupe design. These earlier coupes and convertibles are very beautiful cars, and very, very rare. The Karmann Ghia range was face-lifted in 1958. The "nostrils" were re-shaped and the tail lights enlarged. The headlights were also raised slightly, and right hand drive models were introduced. From now on, the range was slightly more "mass produced". The Ghia received chassis and engine improvements in line with the Beetle until it was discontinued in 1975, looking little different to the 1958 version. Its place on the production floor at Osnabruck was taken by the Scirroco, after about 283,000 coupes and 81,000 cabriolets were built. A Karmann Ghia version of the Type 3 was built from 1961. The styling is loved by some but hated by others. Let's just say that it does not have the universal appeal of the Type 1 cars. They were, however, fine motor cars, with very respectable performance for a car of its time. The model evolved alongside the other Type 3 models until 1969, when it achieved the dubious honour of becoming the first model ever dropped from the VW range! Only 42,000 were ever made. The Porsche/VW 914 took the place of the Type 3 Ghia on the line at Karmann. In 1960, Karmann established a branch factory in Brasil, at Sao Bernardo do Campo. At first assembling the Type 1 Ghia coupe from CKD kits sent from Germany, this plant later produced models of their own design. These were known as the TC Karmann Ghia. 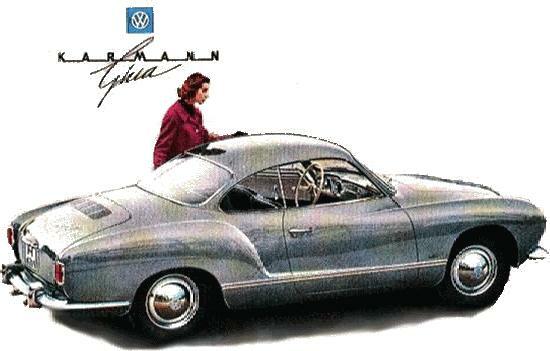 Throughout the 60's and 70's, Karmann put many proposals to VW for a Ghia replacement, but none saw the light of day. Some of these designs were extremely good looking cars, such as the Ital-designed Cheetah of 1971. The Ghia company had become part of the Ford empire by the late '70s. The Golf and Scirroco were styled by Ital Design, but the Golf convertible was an in house modification of the sedan, in much the same way as the Beetle Cabrio. There is little doubt that the Golf Cabrio will become a classic; every other VW with that little black badge on the side has. Although their products are rare in this country, Karmann built Volkswagens represent one of the few things life has to offer that is at once a great investment and loads of fun!